We felt as if we were just walking through a nature park at Arcadia Mill in Milton, Florida. We were actually visiting Florida’s first and largest antebellum industrial complex! There is beauty in the Arcadia Mill woods but also the beastly in the Mill’s history. A large part of Arcadia Mill’s history is industrial slavery. The Arcadia Mill site was a huge complex with various mills, a grist mill, a blackmithshop, a mule-drawn railroad and a sixteen-mile long log flume! The vast complex was built and operated with industrial slavery. At its busiest, the complex included two lumber mills, a textile mill, a bucket factory and one of the oldest railroads in Florida. A portion of the operations included a quarry for ironstone. 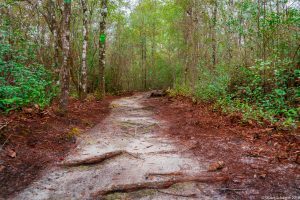 The archeological site is open to the public and owned by the University of West Florida and managed by the UWF Historic Trust. Mill owners, Joseph Forsyth and Ezekiel Simpson bought and sold slaves to labor at the complex. Laborers built a 1,400 foot long and 15 foot-high dam to hold back a 160-acre saw mill pond. 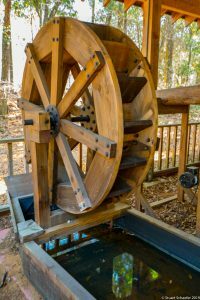 They built a water-powered, wood frame, two-story sawmill on the dam and a second water-powered sawmill about 350 feet downstream from the dam. A 700 foot-long mill race was dug along the dam, which carried water from the mill pond to the second lumber mill. Then later when the textile mill was operating in 1845, a gentleman traveled to Virginia and purchased the 40 female slaves. The thought was that women and children had smaller hands and could manipulate the machinery better. In Forsyth’s last will and testament, he left 24 slaves to his widow to be auctioned off. Those slaves may still have descendants in the area. Today, we generally think of slave labor being used in agricultural settings. However, slaves in the south were often used in industrial work. Today, “Hush Arbors” are held. These memorial programs are held to remember the forgotten slaves of Arcadia Mill. “Hush Arbors” were secret meeting places created by slaves outside plantation quarters. Such sacred spots were often in forests, dugouts and hollows by the river bank. During “hush arbors,” slaves would sing and yell into pots to let out their frustrations and practice religious traditions. Some believe that “hush arbors” were the beginnings of African-American spiritual music. If you are interested in reading more about the slaves and slave life at Arcadia, we recommend reading Rylan Thomas’ Masters Thesis called, Industrial Slavery at Arcadia Mill: An Historical and Archeological Investigation, written in 2010. The thesis is available in the UWF, Department of Anthropology. It is fascinating. We walked the elevated wooden walkway through the old industrial complex. Happily, the boardwalk and a bridge are wheelchair accessible and safe for small children. The 1/4 mile walk winds through the trees with signs pointing out remnants of the mill complex. There are also hiking trails. Access to the grounds is free. A view down one trail on the grounds of Arcadia Mill located in Milton, Florida. There is also a Visitor’s Center and Museum that traces the history and purpose of the Arcadia Mill. The Center has a children’s area with hands-on displays. We recommend going to the Visitor’s Center and Museum first so you will have the historical background necessary to appreciate the signs on the boardwalk. Otherwise, you may find yourself disappointed since you cannot view the archeological work at the site. We spent 2-3 hours at Arcadia Mill and took tons of nature photographs! What a fascinating history it has! It IS a swamp so take bug spray! There is limited parking along Mill Pond Lane and paved parking in the Mill Pond Lane cul-de-sac. Hours: Visitor Center: Tuesday-Saturday 10 a.m.-4 p.m., with exception of major holidays. The grounds are open year-round sunrise to sunset. Dogs allowed on leash. **Industrial Slavery at Arcadia Mill: An Historical and Archeological Investigation. Ryan Nathaniel Thomas. 2010. ***Rucker, Brian R. Arcadia: Florida’s Premier Antebellum Industrial Park. Published, Bagdad, Florida. Patagonia Press. 2005. ****WUWF. Details the Lives of Slaves at Historic Arcadia Mill by Sandra Averhart. February 23, 2015.